Superior Recreational Products (SRP), a leading manufacturer of recreational products today announces the release of Bleachers. With 5 different varieties of bleachers to choose from, we have just the right superior seating for your Facility! 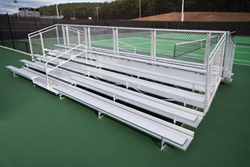 Superior Recreational Products (SRP), a leading manufacturer of recreational products today announces the release of Bleachers. With 5 different varieties of bleachers to choose from, we have just the right superior seating for your Facility! Durable, comfortable, and affordable, our bleachers are built with all-aluminum metal and designed with the most desirable length and height options to accommodate the needs of any indoor or outdoor venue. Low-Rise Bleachers are a perfect economic choice for any sporting complex. With the capacity to seat between 20-72 spectators, these bleachers are great for soccer and softball fields. In search of more seating? Non-Elevated Bleachers are perfect for mid-size venues, offering the capacity to seat between 42 to 274 spectators. For larger venues, SRP offers Elevated Bleachers, with both types of bleachers featuring chain-link guardrails and the option to add one of our Superior Shade structures. Our shade options will keep you cool adding comfort to your outdoor seating experience. Tip and Roll Bleachers are movable bleacher options, great for indoor gymnasiums, featuring non-marring swivel caster wheels for easy transporting and rubber pads that will protect floors from being damaged. For outdoor options, we offer transportable bleachers that can be easy towed and transported from field to field. “Superior Recreational Products is excited to be able to offer a product so sought after in our industry. We have on-staff experts able to assist with any and all bleacher needs. Our team is looking forward to helping our distribution expand into additional marketplaces with this product type!” -Jessica Kyriakos, Site Amenities Brand Manager. For more information on our Bleachers, visit our website! Superior Recreational Products (SRP) has spent nearly three decades developing and acquiring product lines that help you play, relax, and live. We design and manufacture shelter and shade structures, outdoor steel, recycled and themed playgrounds, indoor playgrounds, and commercial site furnishings. For more information about Superior Recreational Products, visit http://www.superiorrecreation.com.